Vitex lucens is a medium to large sized growing evergreen tree from New Zealand. Widely used for its timber will grow from 15 – 20 m and makes a good shade tree. Vitex lucens is known as the Puriri tree or New Zealand chaste tree. Grown not only for the foliage, and the leaves are heavily textured as well as large, this is a tree that also produces much valued timber. It is reasonably fast growing, dense foliage and easy care. 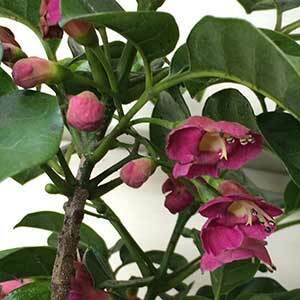 Very long lived and also evergreen, shrub like when young and then develops over time to form a spreading crown. Small red flowers followed by red fruits attract birds to the garden. A wonderful tree for attracting nectar eating birds, this is a sun loving hardy tree, an excellent specimen and worth while shade tree in a frost free environment.